Dr. mario is back and he's now on wiiware ! is the game still a fun experience that was known for ? ... What story ? the game is a puzzler and it doesn't have not even a glimpse of story whatsoever... but for a game like this, I can give it a pass as long as the game is fun. Dr Mario Online Rx is a puzzle game that uses a modified version of the "Tetris: The Grand Master" engine, and it actually has two different modes to play, one of them is just the original "Dr. Mario" where pretty much like other Dr. Mario games and that you can play it with the wii remote sideways, "nunchuck only", with the classic controller and the gamecube controller. 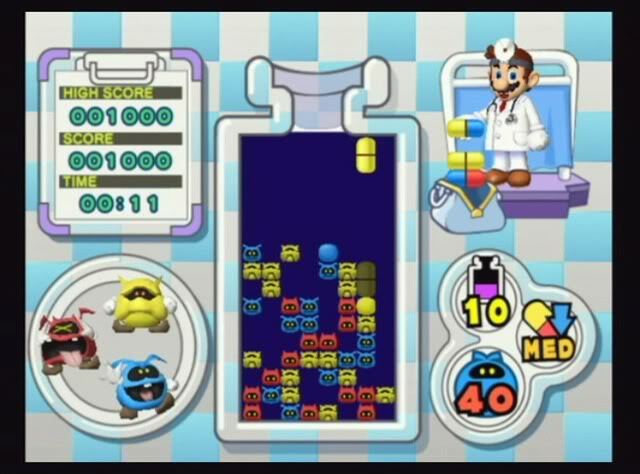 The whole main part of this mode is based on a jar that represents the playing field, and inside of said jar is a certain amount of viruses and there are three types of them in which are colored differently (blue, red, yellow), and your main objective is that you must control the pills that Dr. Mario throws at the jar and they are also colored just like the viruses, so you must destroy the viruses by connecting four or more pills or objects of matching color, eliminate them all and you can move on to the next level. You can control each capsule as it falls, moving it left or right with the d-pad and rotating it with 1 & 2 buttons (if played with the wii remote sideways) so that it is positioned alongside the viruses and any existing capsules, and you can even destroy them both verticaly or horizontaly as it is positioned, meaning that the game requires you to think in how to position and eliminate the viruses. 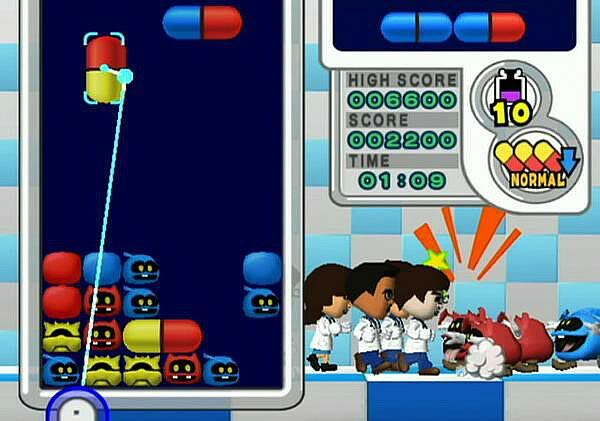 And the other mode is "Virus Buster", which is based on the Brain Age 2 minigame "Virus Buster/Germ Buster", where you can only play this game with only the wii remote, and while it's the same game as Dr. Mario, the viruses and the pill are now bigger and you can control the pills with just only the wii remote pointer, the game is easier than the other mode because not only can you control falling pills that were once placed before, but you can also make them go through a pillar of objects while in the other mode you couldn't even do that ! but even if the game is easier, controling the pills can be very awkward, since the same buttons that you can grab the pills with (A & B) can also rotate the pills as well ! making you mess up a little while playing, there are a few solutions in order to get used to this type of control, but it still feels like the controls could've been a little better, and thanks to an update to this game, you can now play this game cooperatively from 2-4 players. Both game modes also have a score system and it also keeps track of your high score that depends on how much points did you gathered in a single level and not on how much you've gattered throughout the levels you've played, and you can earn more if you eliminate multiple viruses at once. You can also arrange some settings for both modes like the speed (how faster can the pills fall), what level do you want to play (from 1-20, and the difference is the higher the level, the more viruses you have to eliminate) and set which music do you want to hear while playing (which the songs are named Fever, Chill, Cough, Sneeze or you can even turn the music off). The game has a few flaws, but it doesn't drag the game down, and it also requires you to think as well, but as it is, it can be fun for certain people, but for others, it will just be decent. The game looks ok, not because they look decent, but because there isn't a lot to look at, the game and the menus are very bright and can be annoying if you play this game at night, the viruses look cartoonish but good and Dr. Mario looks just as he would look like, but the Mii characters look a little realistic, but the are really cool on how they are dressed as doctors. The soundtrack consist of a few songs, but as a whole it's good, the songs for "Dr. Mario" mode are very catchy and great, while "Virus Buster", even though they have their own remixes of the songs, there are only two opposed to 4 in the other mode, and while they sound ok, they're not as good as the other mode, but you got to love it when the song changes pace depending what's going on in the game. They sounds are also good, they sound comfortable at best and they really set the mood for the game, as for the voice acting... there isn't any, at all ! Dr. Mario never speaks and so does the Miis ! but the viruses can grumble and such, so I guess that counts, and the game can support a lot of languages too ! This game (also known as Dr. Mario & Germ Buster in europe and australia and Dr. Mario & Bacteria Extermination in japan) also has a few modes in the "Dr. Mario" mode as well, which are classic, where it's the similar set-up and design to the original Dr. Mario formula, VS. CPU, where you play against a computer controlled Mii with your Mii, and flash, where you must eliminate three particular flashing viruses faster than the opponent can. and you can also play two player with these modes too (except VS. CPU). 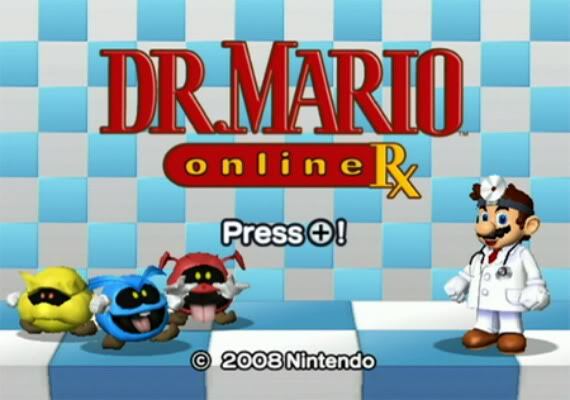 And you can also play this game online with the same modes for "Dr. Mario", you can register friend codes and play with each other and it also keeps track of how many time did you win, loose or tied in online battles, but one unique feature that this gane includes is that you can send a battle demo of the game to a friend who doesn't have the game over to the wii message board so that he can try it out too ! and he/she can play it whenever he/she wants ! but the bad news is, you can't sent it to a friend who lives in a different region... but another thing is that the other mode, "Virus Buster" doesn't have online multiplayer... or any other modes at all. But when compared to it's previous game, Dr. Mario 64, this game lacks a lot of things such as certain modes, the ability to play up to four player on the "Dr. Mario" mode, and even a story ! and even if you don't compare this game to it's previous one, you will still feel that this game is lacking. As for the replayability, you can play multiplayer and online with this game and you can try to achieve a higher score for the game as well and as I've said, the game feels like it lacks some things, but as it is, it depends on how much you like this game. This game costs 1000 Nintendo points, it feels a little overpriced, but it's not bad seeing how there's still some content to kind of justify the price. I love this game. In fact this is the most played game on my Wii console apart from Mario Kart Wii. I used to play this every day with my mom. I think I should postpone my review until Wednesday to spead out our websites new content. I think this game is a bit overrated, but it's still quite entertaining. GOD I HATED THE ONLINE FOR THIS GAME!!!!!!! Only cause i sucked at it. LAWLZ!!!!! I wonder if Mario is really a doctor? This sounds like my kind of game. @Jnes5 I think this is your 25th review congrats. Well well this Sounds better then I thought it would. @Yusei Fudo wrote: @Jnes5 I think this is your 25th review congrats. Actually, this is review is my #18. That's still quite a few reviews. This was my first WiiWare purchase. @LordHoppingRage wrote: This was my first WiiWare purchase. I downloaded Tetris Party a little late in the party, and I don't really find it very enjoyable myself. I don't believe I'll ever be purchasing this adaptation of that arcade/puzzler in the future my friends. 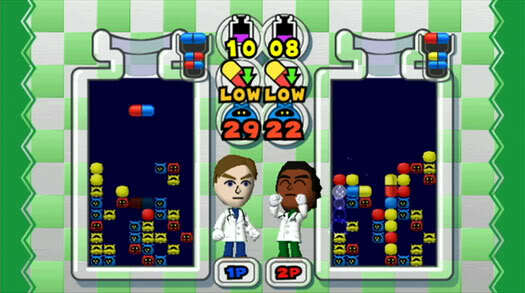 Tetris Party is a totally different game from Dr. Mario Online. This is a great game with a simple, yet fantastic online which adds enormous amounts of value. This is one of the few online games on the Wii that I truly loved. It probably helps that I was actually competent at it. It's an expensive game, and probably not worth it unless you play with friends, but it is indeed satisfying. I'm not a fan of Dr. Mario, but your review is very nicely written.